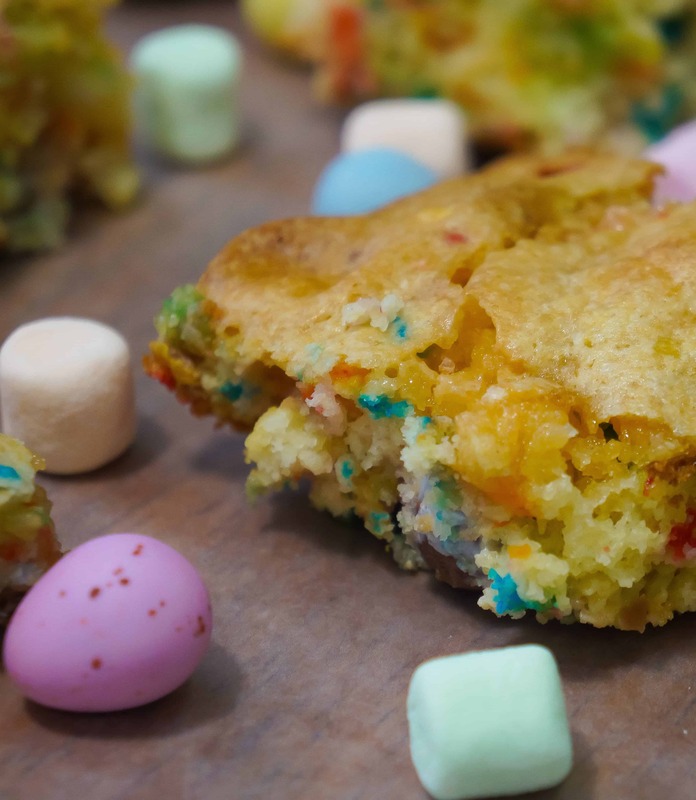 These Springtime Funfetti Bars are any easy Easter treat. Pull out this recipe when you are looking for a super simple dessert to impress your family and friends. These squares only take five minutes to prepare and then thirty five minutes in the oven. I love cake mix cookie bars because they are so easy to make. I already have a recipe for Peanut Butter Chocolate Chip Cookie Bars that are absolutely amazing and I wanted to experiment with something new. This time using Funfetti cake mix. Easter is fast approaching and that means store shelves are filling up with all the traditional Easter treats. I’ve already been loading up on my personal favourites, Cadbury Mini Eggs. Today I wanted to use some of my stash to try out a new springtime treat. I really like cake mix cookie bars, so I decided to make squares using funfetti cake mix loaded with colourful mini marshmallows and mini eggs. I prepared the cake mix with butter and eggs. Then I stirred in mini marshmallows and poured the mixture into a 9 x 13 inch baking dish. Once the mixture was spread out evenly I sprinkled the mini marshmallows on top. Then the whole thing went in the oven for 35 minutes until the top was golden brown. I allowed the square to cool before cutting it into 24 pieces. If you try cutting it while it’s still hot the squares will not hold together very well. They have a sugar cookie flavour and the fruity taste from the marshmallows is awesome. And of course the mini eggs are great too! The marshmallows also make this dessert extra moist and chewy. With just 5 ingredients these squares are incredibly easy to make and delicious. I will definitely be making these a few more times this spring! 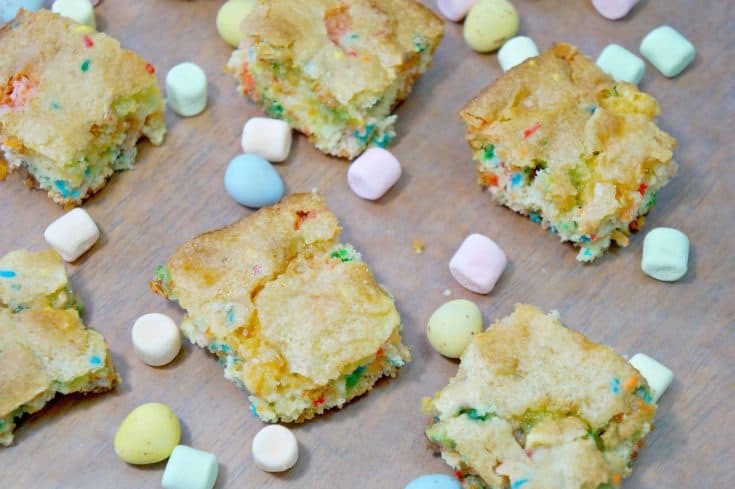 You should definitely add these Springtime Funfetti Bars with Mini Eggs to your recipe collection. 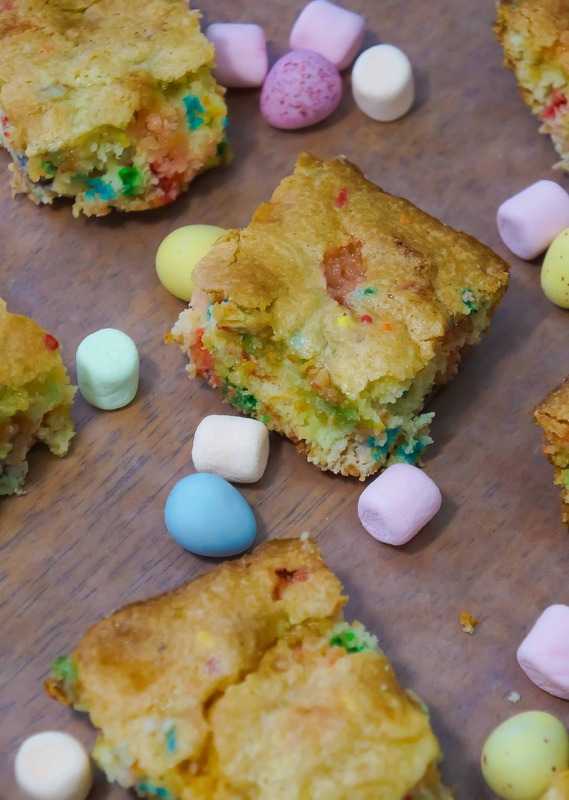 Springtime Funfetti Bars with Mini Eggs are any easy cake mix cookie bar recipe perfect for Easter. 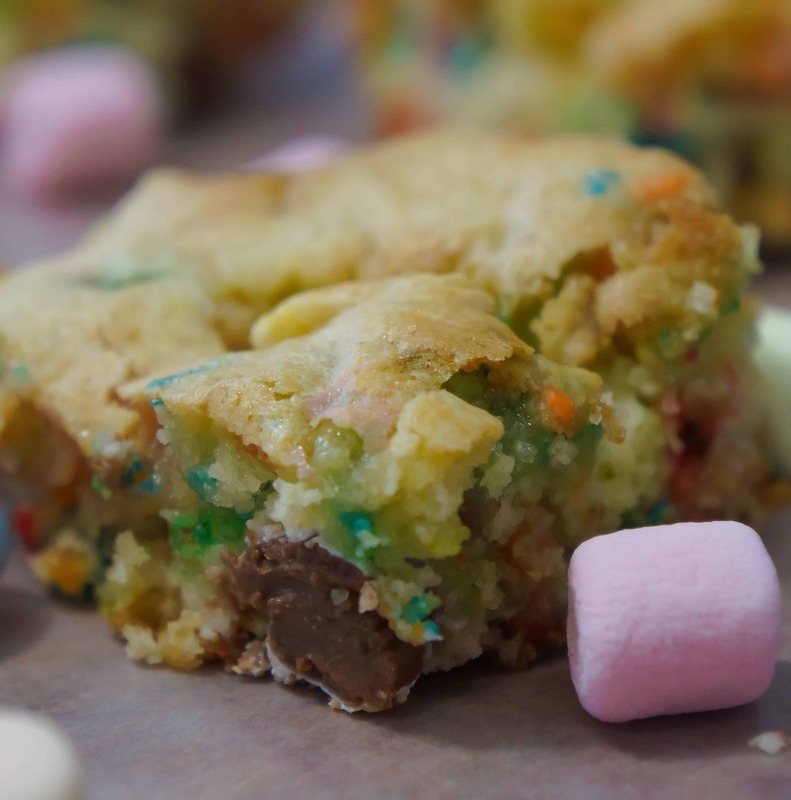 These delicious cookie bars are made with confetti cake mix and loaded with colourful mini marshmallows and mini eggs. Stir together cake mix, eggs and melted butter until smooth. Add in marshmallows and continue stirring. Pour the mixture into a greased 9x13 inch pan and spread evenly. Sprinkle mini eggs on top and place in oven. Bake for 30-35 minutes until whole top is nicely browned. Remove from oven and allow to cool before cutting and serving.